Happy Hearts Mochi | Hawaiian-style gourmet mochi, made by hand with lots of love and care! Happy Hearts has grown into a company uncompromising in the quality and freshness of its products. 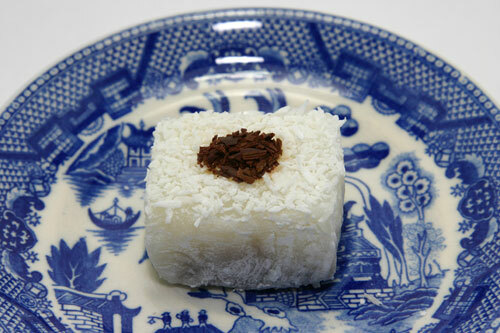 The original mochi lady developed a number of unique and delectable sweets that taste as good as they look. Each piece is hand-crafted with painstaking care in a time- and labor-intensive process. Specializing in fresh, whole strawberry mochi, haupia mochi, peanut butter mochi and seasonal favorites like our pumpkin haupia and kuri mochi, the tradition continues at our new location – Natsunoya Tea House. As we keep the quality and secret recipes alive, it is our hope that Happy Hearts will continue to meet and exceed customer expectations. To all those that have helped make Happy Hearts what it is today, thank you for your support – I hope that you will continue to support us! To those just discovering Happy Hearts, I look forward to serving you and creating more Happy Hearts in the years to come!